The fees for the water service are $60.00 which is a ready to serve fee, which does not include any water and the current rate for water is $5.00 per thousand gallons. Our billings are done on a quarterly basis. 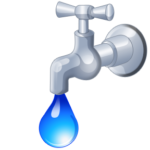 The water department will turn your water off and on one time per year at no cost. Additional turn offs/on will cost $100.00. This is used mostly for residents who are gone during the winter. If your water is turned off you will still receive a bill for the $60.00 ready to serve fee. There is a fee of $100.00 for people who request a turn on/off without 24 hour notice to the water department. Latest news: The Sims-Whitney Utility Authority is in the process of working on getting a new micro-filtration plant designed and built to replace the old plant.